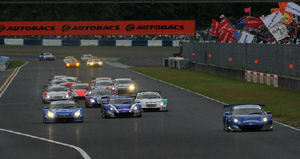 On Sunday May 22, 2011, the Okayama GT 250km race, Round 1 of the 2011 Autobacs Super GT, took place at the Okayama International Circuit Okayama International Circuit in Okayama Pref. The winner in the GT500 class was the No.12 Calsonic IMPUL GT-R driven by Tsugio Matsuda and Joao Paulo Lima de Oliveira. Initially scheduled for April 2nd to 3rd, the original Round 1 "Okayama GT 300km Race" was postponed in the wake of the tsunami desaster in the north of Japan on March 11, 2011. Race day at Okayama Circuit saw heavy rain showers from early morning, but the weather began to improve suddenly from around 9:00 am, and by the time of the start the skies were clearing. The formation lap began at 2:00 in the afternoon with an air temperature of 23° C and a track surface temperature of 29° C. After the formation run, the pace car returned to the pit area and the race officially began with a clear start. The cars went into the first corner in their qualifying order with the No.17 KEIHIN HSV-010 driven by Toshihiro Kaneishi in the lead, followed by the No.12 Calsonic IMPUL GT-R of Joao Paulo Lima de Oliveira, the No.100 Raybrig HSV-010 driven by Takuya Izawa, No.36 PETRONAS TOM'S SC430 of Andre Lotterer and the No.38 ZENT CERUMO SC430 with Yuji Tachikawa behind the wheel. Behind them, the 7th-position starter, the No.8 Arta HSV-010 of Takashi Kobayashi lost a position. 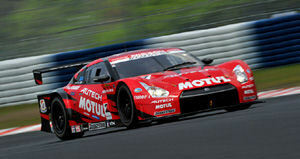 Perhaps the pressure of being assigned as start driver in just his second GT race had gotten to the rookie Kobayashi. Meanwhile, as the race proceeded, Loic Duval in the No.1 Weider HSV-010 was gradually moving up through the field from his 9th-position start. The same was true for the winner of the last round at Fuji and 12th-position starter this time, the No.23 Motul Autech GT-R.
After passing the No.8 Arta HSV-010 of Kobayashi on the first lap, Duval in the Weider HSV-010 went on to pass the No.6 ENEOS Sustina SC430 driven by Kazuya Oshima on lap five and the No.39 Denso SARD SC430 of Hiroaki Ishiura on lap eight to catch up with the group battling for 3rd position. After driving conservatively in the early going to preserve his tire performance, Treluyer in the No.23 Nissan GTR moved up to pass the No.6 Lexus SC430 on lap 21and then went past both the No.39 Denso SARD SC430 and the No.24 Advan KONDO GT-R of Bjorn Wirdheim brilliantly on lap 23. Treluyer continued to hold a steady pace as he extended his distance to a longer than usual stint. 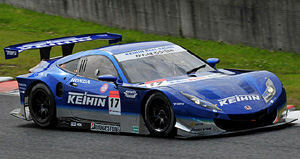 Throughout the first half of the race, the battle for the lead was a two-car contest between car No.17 KEIHIN Honda HSV-010 of Kaneishi and the No.12 Calsonic IMPUL GT-R of de Oliveira, with the gap between them varying from three to as much as five seconds at times. Some distance behind them there was a close-fought battle for 3rd between car No.100 Raybrig HSV-010 of Izawa and the No.36 PETRONAS SC430 of Lotterer, with Duval in the No.1 Weider HSV-010 eventually joining the fray. 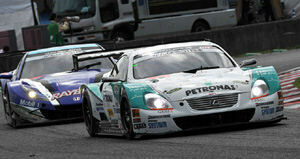 The first among these to make a move were Izawa in car No.100 and Lotterer in No.36. At the end of lap 28 these two returned to the pit at the same time. When the two cars returned to the race, however, car No.36, now driven by Kazuki Nakajima, was in front of No.100, now driven by Naoki Yamamoto at the wheel. On the next lap, No.17 with Kaneishi at the wheel, the No.38 ZENT CERUMO SC430 of Tachikawa and the No.6 ENEOS Sustina SC430 of Oshima made their pit stops. Then, at the end of lap 30, the Oliveira in the No.12 Calsonic IMPUL GT-R returned to the pits.